After a Few Dry Days Wet Weather Returns…..
Sun. Apr. 28, 2013….. A busy week, after several nice days we got some wet weather midweek….a couple more nice days….now wet weather is returning. 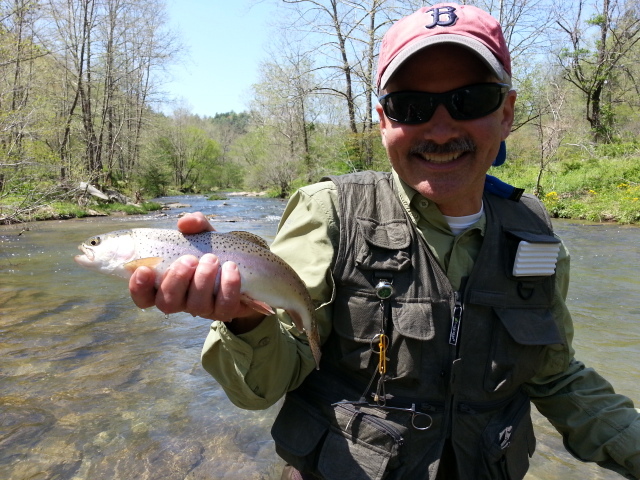 Had a great outing on Monday with Clint Truman, Jerry Wells, and Dan Campbell of Syngenta, Greensboro, NC, and we had a 40 fish plus outing with great weather and some dry fly fishing to end the day. 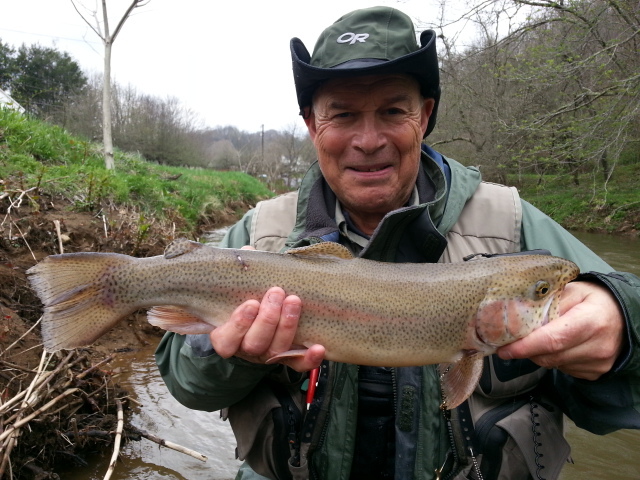 Tuesday I guided Dr. Art Kriner, who is going on my Wyoming trip in August, and his son-in-law Dave Wiebking, and we fished some remote areas in Wilkes and Caldwell County, and had some outstanding fishing and again landed between 30 and 40 fish. It was one of the few places where the water was in good shape and clear. Wednesday we did our fly fishing 101 class and all the class is progressing nicely, some great fly casters in this group and we did some rigging/knot tying, gear and equipment, entomology and flies, presentation techniques, etc., and finished up with some fishing. The group landed several nice bluegill and Anita Vigorito caught a nice bass too…always great when you can put a few fish in the net. Thursday I guided Mike Workman and we drove far west after thunderstorms and rain mid week in NW NC and SW Va blew out our planned private water trip. We instead fished the Catawba River and 2 other waters and did pretty well chucking nymphs and streamers and tallied maybe 30-40 fish or so…and finished up with some dry fly fishing and a sulphur /yellow stonefly hatch and about a half dozen wild rainbows and browns to end the day. Water was up everywhere……. Friday we put an exclamation point on the week as I guided a regular client Durham Potter of Raleigh, NC, and after a slow start fishing some high, murky conditions we did very well, ending the day strong with over 30 fish and 6 fish that were citation sized….all but 3 fish at the end were caught with my slip bobber deep water rig. It catches the bigs in deep water. As the best trip of the week, Friday was definitely it even with high and dirty water….and definitely one for big fish…Here’s how the day went…. 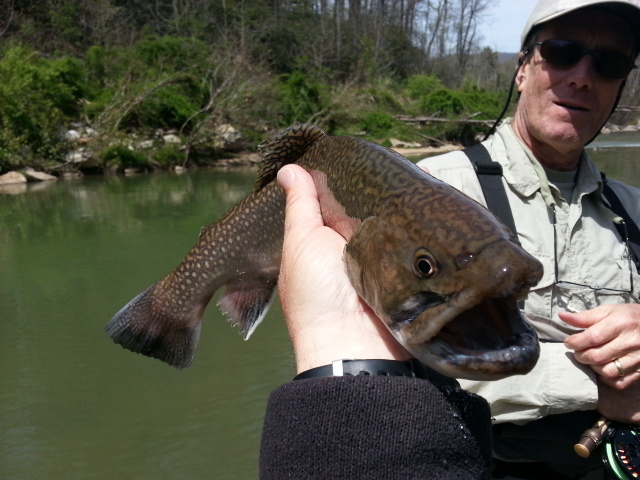 We fished near Spruce Pine, and we did well landing about 25-30 fish….not tons of fish but man we caught some good ones. We got a later start as Durham was coming from Raleigh, NC, and it was frosty cold in the morning….like upper 20s. April right? It was chilly, the water was chilly,water was high, had a gut feeling that if we took a chance on some of my fave water and put in methodical dredging the deep banks and holes that we could turn up some large fish. We started and netted about 8 or 10 fish from when we started and lunch. The water was high and pretty strained, you could only see down 18″ or so. Durham is a great caster with lots of saltwater experience, particularly bonefish, and he is adept at casting distance with heavy stuff. In order to fish this having that ability is a must. This is big water, so in order to fish it you absolutely have to know where to walk…and some places you might taking a swim if you veer slightly off track. And with the water up you also absolutely have to know where you are wading. We got into a section of water I love but that is a bear to wade and fish. Deep, like 8 to 10 feet. We fished my slip bobber rig and nailed 3 large fish that were 20″ or more in consecutive casts. And a 20 inch trifecta. 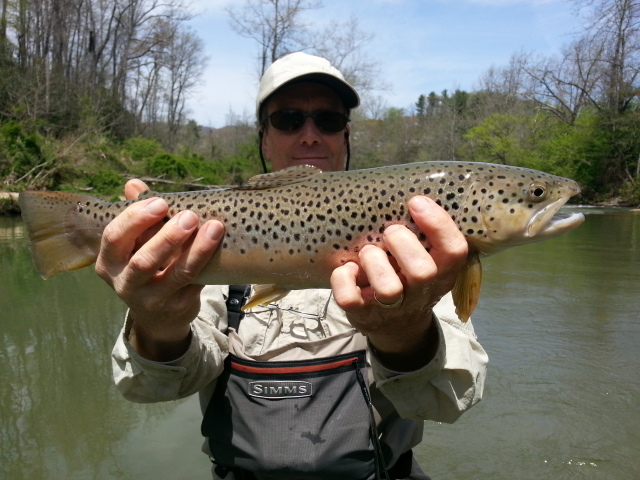 Don’t know if I have ever had someone do that….nail a 20 in brown, rainbow, and brook trout on consecutive casts. 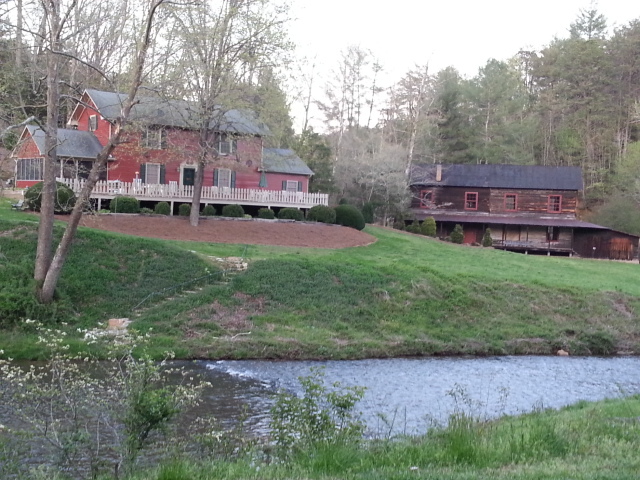 That’s what Durham did….plus one small brook trout. We ended up landing 5 fish over 20 inches from that stretch and about a dozen other fish that were smaller and lost one beast of a rainbow that broke off on a mid river bar that was near the 28-29″ mark and probably pushing 8 or 9 lbs. A beast by any standard. We fished our way through the deep stretch, and it yielded its bounty to my deep nymphing rig like it has so many times this season. We fished one last spot and caught a couple small fish…then Durham said…..”I’d sure like to end the day with another big guy.” I thought…..and said….”Well, lets try to do just that.” I re-rigged his leader and tied on one of my 8 inch articulated streamer patterns …..like a bass or small pike sized fly but I tie them with rabbit strips. 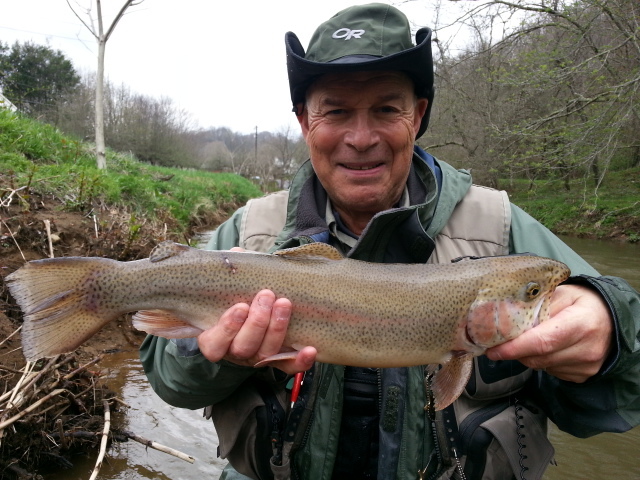 On the second cast to a wooded, rocky bank I knew held some bigs about three strips into it Durham was fast to another beast…this one a rainbow of about 21 inches. Think a 8 inch fly is too big for a 20 inch fish…? Think again. We caught one more beast on it, a brook trout, and two browns that were 13 inches. 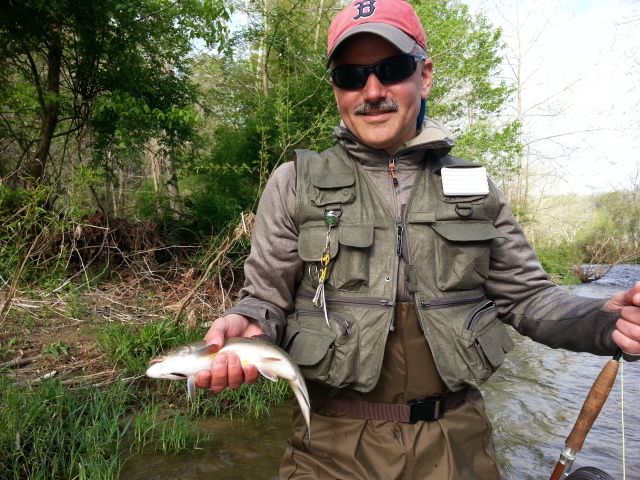 That’s right…a 13 inch fish on a fly that is nearly 8 inches. That is why a size 6 or 8 really isn’t that big of a fly. But anyway..on those fish, tired and hungry we left the river and decided to call it a day.. Great day….a big fish day…..Below is a video clip, or you can click here if you can’t access the video below…. We postponed our Saturday GTCC Class Field Trip as where we were headed the water was up and dirty and also the threat of more rain on top of that situation. We are resheduling for June 1. That ‘rain is coming’ mantra will stick with us too, as today and Monday looks like we’ll have showers/rain and maybe a rumble or two of thunder. Half inch of rain this morning, half inch tonight, then half in tomorrow. So all in all an inch to an inch and a quarter or inch and a half of rain. That will create some sketchy conditions again. Preparing for a few trips early this week, one with two regular clients Dr. Jim Singer and his wife Susan, great folks, great fly anglers too, and then our GTCC flyfishing 101 class final session on Wednesday. 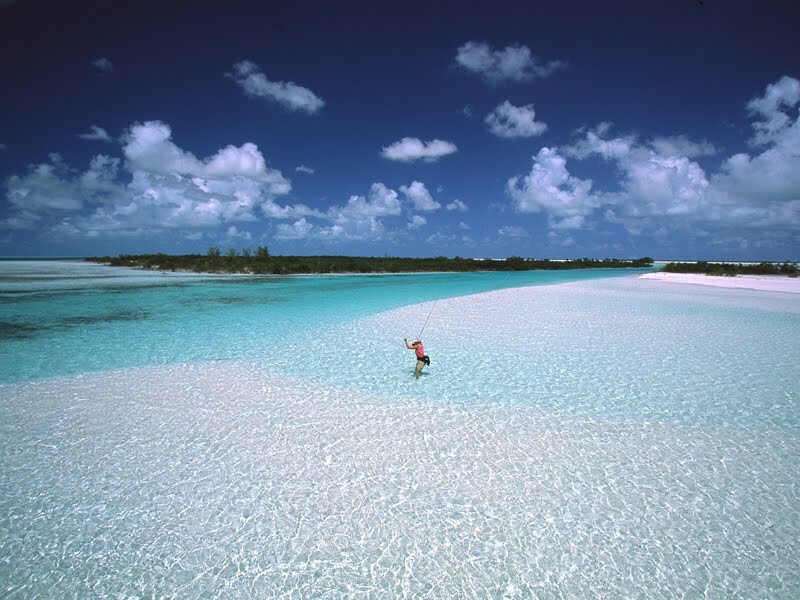 Will be finishing up fly orders, getting our newsletter out, and then leaving early Thursday morning to Charlotte and flying to Nassau, Bahamas for a six day group bonefish trip. We’ll be fishing North Andros and the renowned Joulters Cays area and catching some of ‘dem bones…..
Emjoy the remainder of your Sunday, a great Lord’s day to you and Have a great week…! May all your loops be tight and all your hatches match…. 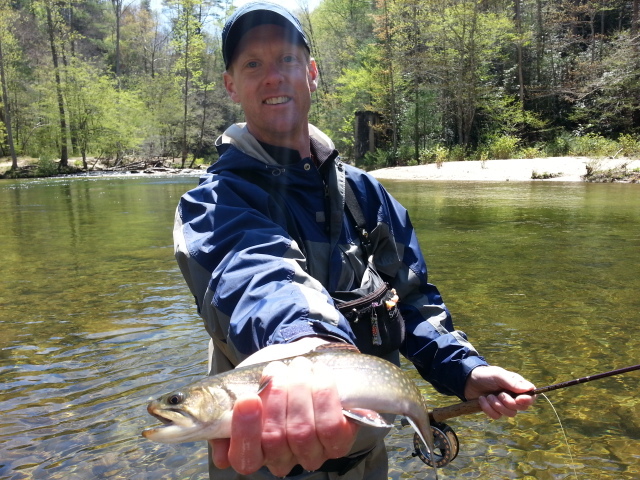 Friday’s Client Durham Potter, Raleigh, NC, with a ‘toad’ of a brook trout that was caught using my deep water slip bobber technique/rig…. Mon. Apr. 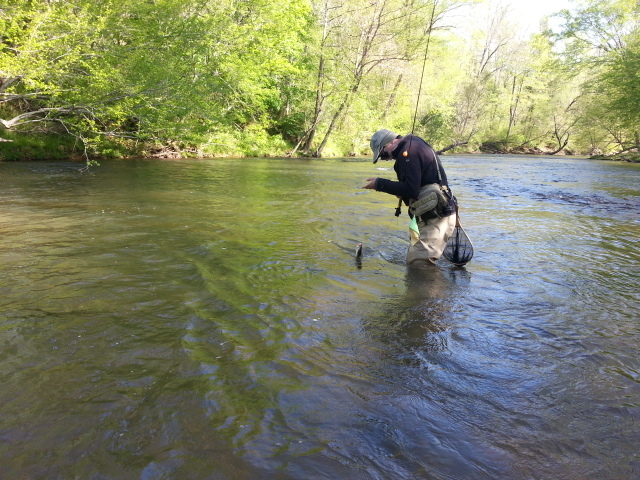 25, 2013…..Guiding Mike Workman today and we have done ok, landed maybe a dozen or son brookies and rainbows. It was chilly to start, feels fall like. Caught fish on a mix of flies large and small, a small red Copper John has worked well. We are getting ready to break for lunch and will be heading to another stretch after lunch. Freeze warning tonight for most of the mountains so dress warm if you head out. Nice today but Sat highs and Sun too will be in the upper 40sF. Pretty cool for late April. Thurs. Apr.25, 2013…..Nice day but cool it is. Cold front pushed through and we got rain and more in coming for the weekend. Guiding Mike Workman of Thomasville, NC and we are getting ready to step into the river. We are fishing the Catawba River. Looks like deep nymphing and maybe some dry fly action this afternoon. Things are Clearing, Slowly……..Dry Fly Relief Has Begun! Wed. Apr. 24, 2013 …..Have been dealing with high and murky water the past week but things are slowly getting back to normal. Guided Dan Campbell,Clint Truman, Jerry Wells, Greensboro, NC, NC Mtns,we had a super early start and did so with the intent of us hitting two or three waters if necessary if things were still as high as they have been. Well, high they were, and I have done a lot of miles lately looking for the clearest water but we did well. It was high, about 8 inches high to be exact, and it was cold. Chilly , 32/33F and frost on the ground….chilly for almost the end of April. 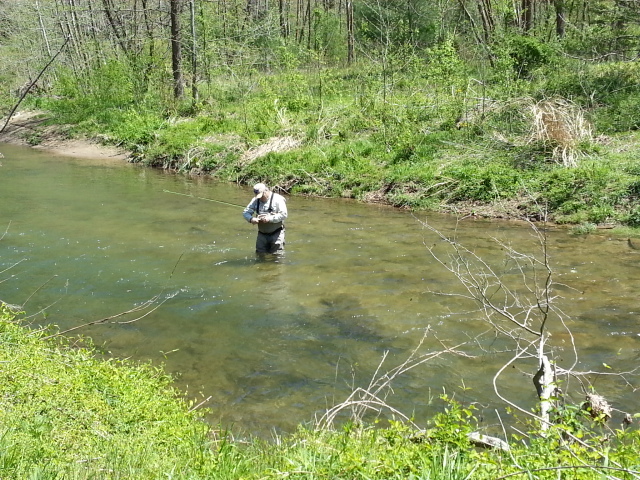 We fished a variety of nymph rigs and did well with them, tallying about 25-30 fish by noon or lunchtime. We also landed 3 or 4 huge redhorse suckers, as they are in full spawn mode. When suckers are spawning, a light orange y2k or light orange egg is the ticket…yellow/orange even the better. Some of the fish were obviously munching on sucker eggs. We had a lunch, then back to fishing. We fished two or three more stretches and ended up catching maybe 20-25 more, including two citation fish, one huge brook trout caught by Jerry and a ginormous hook jawed beast of a rainbow caught by Dan. 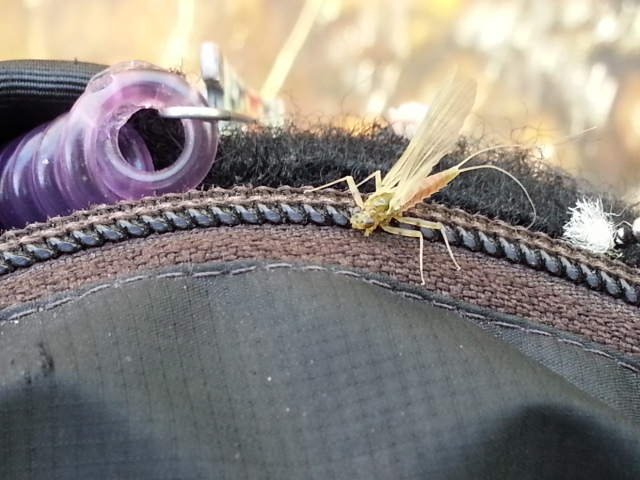 We hit one last spot at the end where I felt we’d have some dry fly relief….and so it was. We nailed about a half dozen more fish nymphing then maybe 8 more on a dry. Clint landed 6 on dries as the fish were rising and the bugs , a mix of bwos, sulphurs, and pale evening duns were pouring off. Saw a few yellow stones and smaller caddis, an indication spring is fully sprung…and summer isn’t far off. Great day, great guys….we had a blast. You can catch the full report and pics here at our main website fishing reports page . 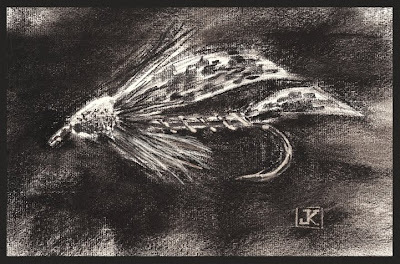 Some other great midweek tips from our friends at Gink and Gasoline Kurt Klewein and Louis Cahill…here’s a piece on choosing flies for tandem rigs…when nymphing….click here. Along with this is a critical skill, especially if you fish nymphs…..is the roll cast mend. Its a valuable skill to add to your toolbox….click here. Have a great one….have trips Thurs, Friday, and Saturday and hoping the conditions hold up as the fishing has been great. Good Morning….Things Are Settling Down A Bit…. Mon. Apr.22, 2013…..Nice day to be outside, Guiding Dr.Art Kriner and Dave Wiebking and we drove about 3hrs to reach clear water. Water is still way up but conditions are slowly improving. 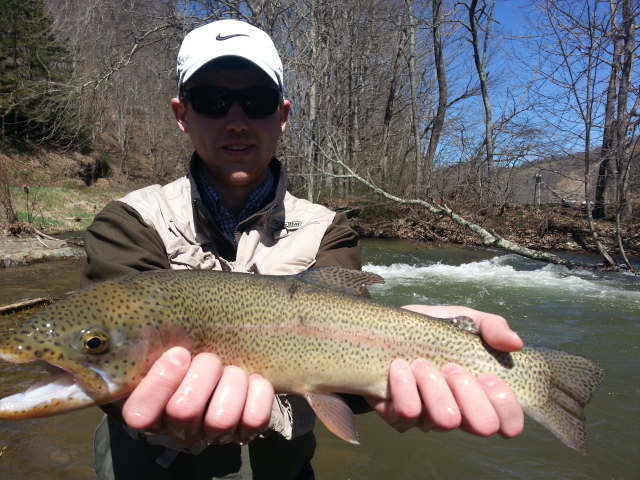 We have landed a 25 fish mix of rainbows and brookies and 1 brown of 16". Smaller patterns have been the predominant factor in catching fish. Any bead head and make it small. 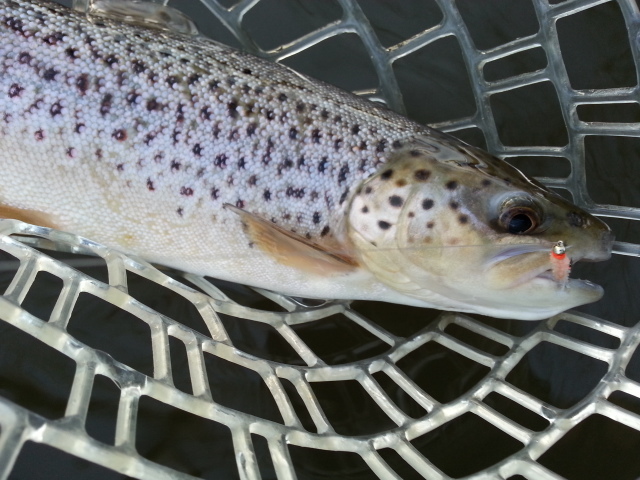 Change often and use fluoro tippet….that has worked nicely. Took a lunch break then hit another spot for a few hrs before calling it a day. Landed about 30-35 fish so it was a decent day. Headed back and getting ready for tomorrow’s trip with Dan Campbell group from Greensboro. Sun. Apr. 21,2013…Things are still clearing out and dropping after the rains over the end of the week….wow….some areas got up to 4 inches depending upon elevation. Hopefully some dry fly relief is coming soon! Tons of bugs hatching right now as the local waters on the front slope of the Appalachians /Eastern Continental Divide have water temps in the low to mid 50s….that means lots of caddis and mayflies…most notably the Hendrickson and sulphur species. Tons of sulphurs were hatching about 7pm on the Mitchell River in Surry County on Saturday…as I stopped there on my way in to see what the water looked like. High, yes, and norm flow is about 125 and it was almost 200cfs. Dicey wading…go down and you get real wet and probably take a short ride downstream. I grabbed a rigged rod out of my SUV and made a few throws….landed about 3 rainbows, 8 browns, and 5 brookies …in a little over an hour’s worth of fishing. No rising fish with the water level but if it had been normal this would have been a dry fly event to write about. No many folks are aware of it but the Mitchell is a bug factory….has more insects per square yard of bottom than any water in our area. That is because it flows from a pristine and relatively undeveloped headwaters. It also is among the cleanest rivers in our region. Caught several browns on the Mitchell…I remember fishing this river since the early 1980s….it was trout water then as well and would also yield an occasional smallmouth up to 2-3lbs. Haven’t seen one that size in the Mitch since the 1990s. 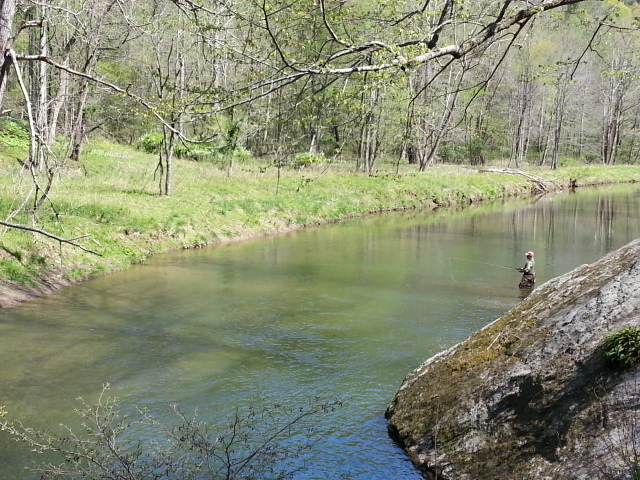 But it also is a good smallmouth creek as well….great to fish in summer when it gets too warm for trout there. Have a great week and hopefully we’ll get back in the groove soon as I have trips everyday but the flows are still dicey…fingers crossed! Apr. 20, 2013….Given the hard rains of yesterday that is what I feel like today was. A gift from the Lord….and I will take it! Guided Dr. Ken Karb, Dr. Hy Muss, and Ted Birke and it was day 2 of their trip…and things were high and blown out pretty much everywhere. I mean like bank full and brown to chocolate milk. Of course 2 to 3 inches of rain will do that. We got a later start as temps in the upper 20s and 30-35mph NW winds made it pretty chilly. …make that really chilly for late April. We had to stick to nymphing pretty much, after the temp swings from 65F yesterday to 28F this morning the fish didnt want to move much. We fished slowy and methodically and picked up a fish here and a fish there. 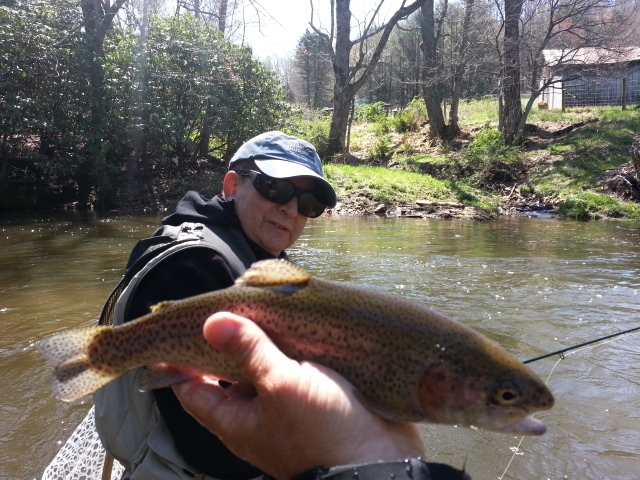 Ken landed a 20-22" rainbow and 3 other fish, and Hy landed 12 fish…a mix of rainbows, browns, and brookies ….and Ted a half dozen browns and brookies. We fished our way through a 1/4 mi stretch of river and did pretty well scoring another 6 fish ir so. We had lunch streamside and went upstream to a different area and caught probably 10 more fish, Ken was the high man after lunch with 5 fish…all rainbows while Hy and Ted landed 5 more…all brookies. 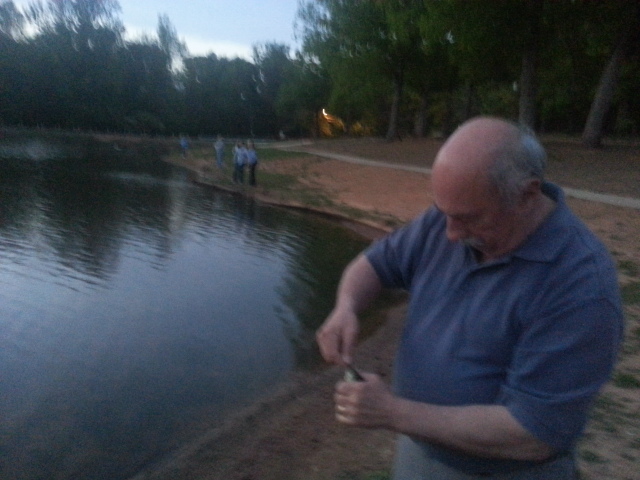 We finished the day with a little over 40 fish. And given the weather we have had the past three days that is a miracle. Lots of bugs coming off and looks like some dry weather coming up. 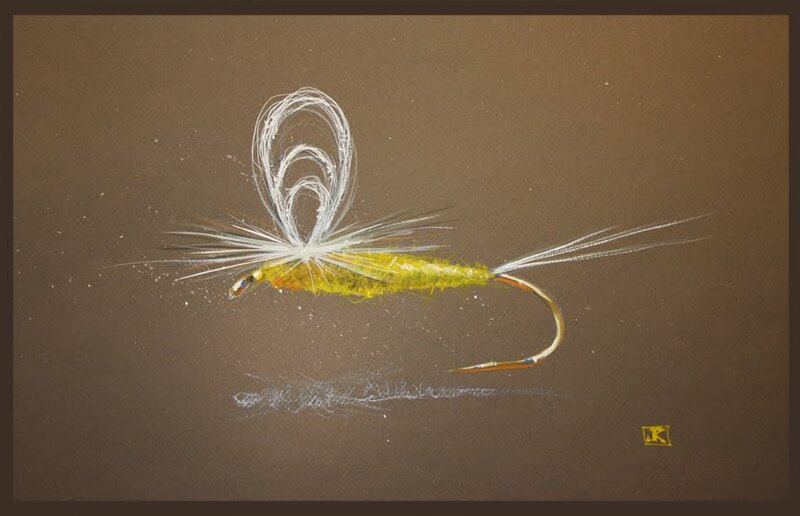 Could be our first real taste of dry fly relief…..lets hope! Fri. Apr. 19, 2013…..Today was soggy, but also a gift as I feel fortunate that we were able to fish at all. Things were high and swollen already and then the rains came. I guided Dr Ken Karb, Dr Hy Muss, and Ted Birke and we had a decent outing despite all the rain. The guys were staying for a few days so they wanted to fish regardless. We caught a few before the color of the water got so dingy that yanking big streamers was our only option the rest of the day. We did well considering the high water netting about 25-30 fish total and Ted with the largest a rainbow that measured just under 22" at 21.5 ". We quit about 4pm when some extremely heavy downpours pretty much ended it as the water went past the threshold of the level and color that you can still expect to catch fish. We are watching the water levels this evening to see if fishing tomorrow will even be possible since the heavy afternoon rain and resulting runoff has everything here high and blown out. Have a great evening…and pray for a few dry days! Wed. Apr. 17, 2013…. Been a couple days since I have posted a report, been at home taking it easy recovering from a back procedure and am on the mend and will be back in action tonight with our Beginning Fly Fishing class. I have a great group, and we are making great progress. Have some really good casters in this group of folks, and we’ve had a blast so far. Did a trip on Monday, another very wet day as we got more rain than weather folks were calling for….Guided David and Adam Carter, Greensboro, NC, NC Mtns, did a day trip to nearby water, things are high and roily in a lot of places, like just about everything…some front slope waters like Stone Mtn. 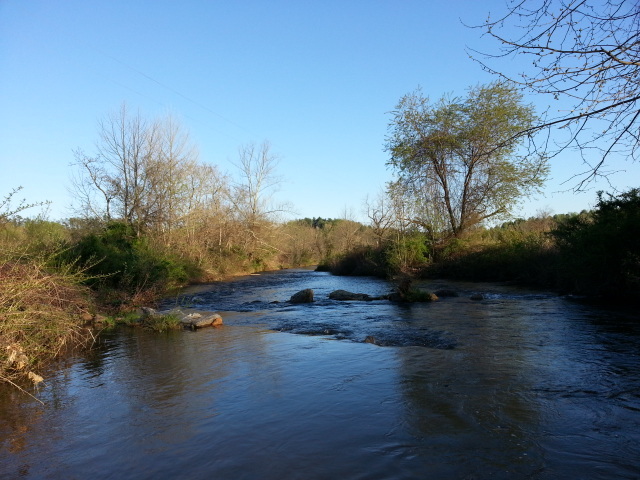 , upper Yadkin/Buffalo Fork, South Mtns…these waters have remained a little clearer but high but man has it been wet. Just seems to be no end and there’s more coming…. We did ok, we nymphed with big ugly patterns and landed about 25 -30 fish in some tough conditions….felt good about that and also caught a couple really nice fish. A good day anytime that is the case…. You can view a few photos of our day plus reports on other recent trips at our Fishing Reports Page. Ran across a great podcast from one of my faves Tom Rosenbauer of Orvis, its a great piece on Top 10 Excuses for Getting Skunked…….Funny! Click here to listen . Looks like another thunderstormy (is that a word?) day in the mtns, some rain tomorrow, then a potent cold front for Friday with a round of heavy showers and thunderstorms possible. But its spring right? We’ll see how it affects fishing….have trips everyday except Sunday so I am watching this one closely. Have a great day today…..more to come.. Challenging Day Turned Out Ok…. Sat. Apr. 13, 2013…..Had a trip today and guided James Smith, Kevin Smith, and Dr Steve Smith and we fished the backside of the runoff from Thursday nights storms. 1 to 2 inches of rain had the stream still up and dirty. Things had cleared up just enough this morning to warrant fishing. Got an early start and we were in the water and fishing by 745am. We landed probably 10 fish the first hour and was I ever relieved because the water was way up. We fished on and caught a good many more before lunch including 2 citation rainbows by Steves son Zack who is a junior at VT. We took a lunch break and fished the second half of the day and did well too netting about 25 more or so. We put 45 or so in the net, no small fear given the conditions we had. No one else on the river seemed to be catching anything…which made me feel all the better about how we did. We also landed one more citation rainbow, caught by Steves other son Logan. So all in all it was a great day. We fished heavy nymph rigs, short lined it all day, tons of weight and very careful drifts. Its a high water strategy I have used in tough high water conditions for many years and today it worked like a charm yet again. A day of rest tomorrow and some time with my bride and son and Mondsy will be guiding another trip with Adam and David Carter. Ought to be a good one with falling water. Have a great evening… !